Sports Land was incepted in 1970 in Meerut, Uttar Pradesh as a sole proprietorship firm and has been in existence for more than four decades. Until 1982, Sports Land has been manufacturing footballs, carrom and sports nets and selling them within the Indian market. Sports Land was blessed with a lot of success in this field but given that the market was still under developed, overseas market seemed to be the most lucrative option. In 1990, Sports Land took a plunge into the overseas market of track & field equipment soon to be followed by soccer training equipment in 2001. Gradually sports land switched over to only manufacturing and exporting specialist track & field, sports nets, soccer training, rugby, gymnastics & cricket equipment. Ever since, Sports land has been reinforcing its image as the most dependable Manufacturers in the Indian sports industry. Currently Sports Land is a private limited company with a 100% focus on the overseas market. Sports Land is Manufacturers and Exporting Group specializing in Sports, Performance Enhancement Equipment, Primary Educational Play and Sports Wear. • OE & licensed Manufacturers for leading global brands. Also were official & licensed Manufacturers for ICC world cup 2007. • Winner of several Export Excellence awards from Govt. of India since more than two decades. • Facilities expanded over area of 30,000 sq ft.
coating, plastic molding, precision machining, pad printing & sewing. • Products backed by 100% guarantee against all manufacturing faults for 12 months. • Eco- friendly and Non-polluting industrial processes. • No child labour used in production. Our commitment to continuous quality improvement is apparent in every aspect of our products, services and customer support which has helped us in winning over the trust of our clients. We have a trained quality staff of 5 people to control output of approximately 100 people involved in production activity. We aim for non-negotiable standards at Sports Land. On-Line inspection is carried out in injection molding, Trimming, Finishing, Turning, Power Press, Cutting, Sewing, Printing and finishing process. Incoming material Inspection is done off-line before the goods enter the stock control room. Final inspection is also undertaken off-line before and after packaging. Our QC staff is trained in SQC methodologies to analyze sampling data and detect any defects in the mass produced products and processes. We assign each of our buyers a merchandiser who is available to help them and be in constant touch with them throughout the process. Our quality management systems are certified by ISO 9001:2000 and the social accountability is in compliance with SA 8000:2008. Certificate Awaiting. Many of our selling products are CE certified and many of our product are certified with the EN71 and EN913 regulations. Our organization is fully committed towards providing our worldwide clients with maximum satisfaction by offering them products as per their specifications. Our fully dedicated team works in close coordination with our clients to thoroughly understand their requirements and develop the products accordingly. We offer them in accordance with the different needs of club matches, league matches, practice matches and more. With customization as our forte, we aim to provide our clients with advantages that even other premium brands don't provide. We are involved in manufacturing products with highest quality for our clients spread all over the world. We have been exporting successfully to USA, Canada, South America, Australia, New Zealand, South Africa, Germany, UK, France, Denmark, Spain, Sweden, Norway, Ireland Singapore, Malaysia, Philippines, UAE and Japan. Our buyers vary widely and includes some of the large retail hypermarket chains and sports goods wholesalers and distributors. We have done promotion for 500+ brands. * We are not authorized to sell these brands unless you have a license. We have more than 10,000 sq ft area for production with world class infrastructure and highly efficient work force. Almost 80% of the products listed on our catalogue are produced within our production site. Complete manufacturing facilities are available under one roof i.e. metal castings, automatic plastic injection molding, plastic extrusion machines, latex rubber, precision machinery, powder coating & electroplating, sublimation printing, pad printing & screen printing, fully equipped stitching department, over locking machines for sports nets, fore thread machines, mould design and manufacturing (Auto Cad and CATIA), lathe machine, arc welding equipment, pipe and tube bending machines and blister packaging unit to handle a vast range of sports goods & equipment. Our manufacturing and delivery platform effortlessly combine expert craftsmanship with the technological manufacturing wonders. In order to execute many orders that are produced simultaneously in our factory, it is important to be able to trace the orders on-line as well as off-line. While off-line is always time consuming, our on-line traceability helps us trace the orders anytime during the production. This allows us to advise the status of the shipment to you very quickly. Sports Land Overseas Pvt. 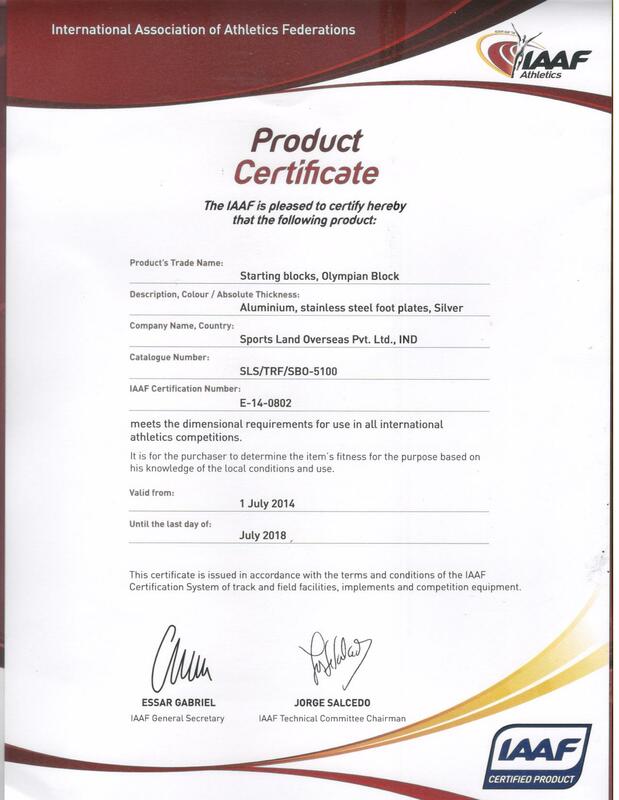 Ltd. has been remarked as a premium Manufacturers and exporter of qualitative sports goods. We are delivering our best and our supreme quality sporting goods are being appreciated by many government bodies and sports organizations. 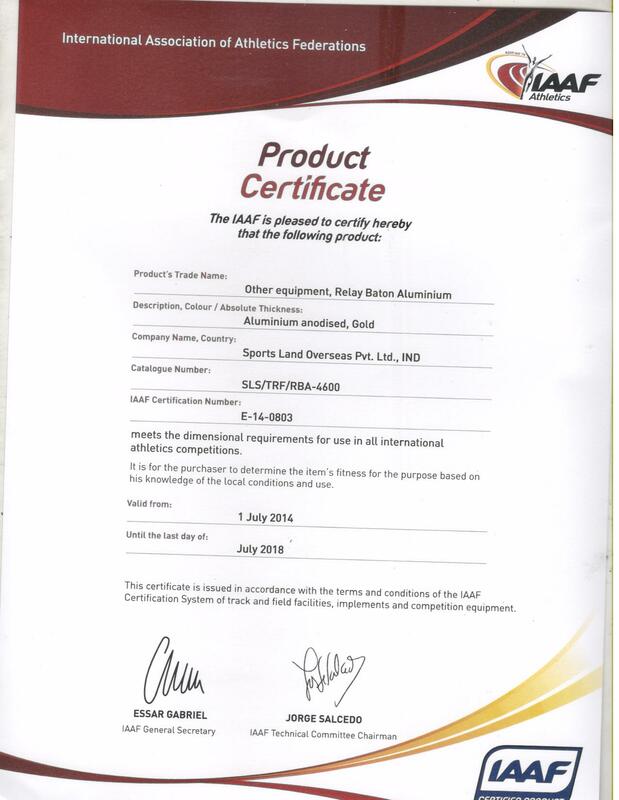 Our company has been awarded for quality sports products by Government of Uttar Pradesh. We have received several export excellence awards, state export award certificate, trophies as acknowledgments and many more.